García, J. Correa, G. Rousset, B. (2019), Trends in infant mortality in Venezuela between 1985 and 2016: a systematic analysis of demographic data. The Lancet Global Health. DOI:10.1016/S2214-109X(18)30479-0. Mi amiga Brenda Rousset Yépez me envía este artículo que acaba de publicar junto a dos compañeros demógrafos venezolanos. Os presento un ejemplo magnífico de investigación empírica y científica, y de capacidad para desmentir tópicos y visiones políticas oficiales. Con gran rigor en la metodología, contraste de fuentes diversas, y transparencia y replicabilidad de los resultados, estos investigadores demuestran que se está produciendo un retroceso notable en la mortalidad infantil de su país. No sólo contradicen así la versión oficial nacional, sino también la internacional, basada en los importantes avances globales conseguidos desde los llamados Objetivos del Milenio. Estos logros, reales y constatados, tienen en Venezuela una desgraciada excepción. En un momento en que la actualidad política del país hermano acapara titulares y acciones diplomáticas y económicas, es de agradecer que los demógrafos recuerden al mundo que la situación es dramática por motivos tanto o más importantes, como la vida o la muerte de los niños. Gerardo Correa es Profesor Investigador en la Universidad Católica Andrés Bello. Jenny García es investigadora de ‘Institut national d’études démographiques (INED). Brenda Rousset es profesora de la Universidad Central de Venezuela. Aquí tenéis un par de entradas de ApdD sobre su trabajo: Proyección de hogares, en Ebook de ALAP / Tesis doctoral: Proyecciones de hogares: una aplicación para Venezuela al horizonte 2021. 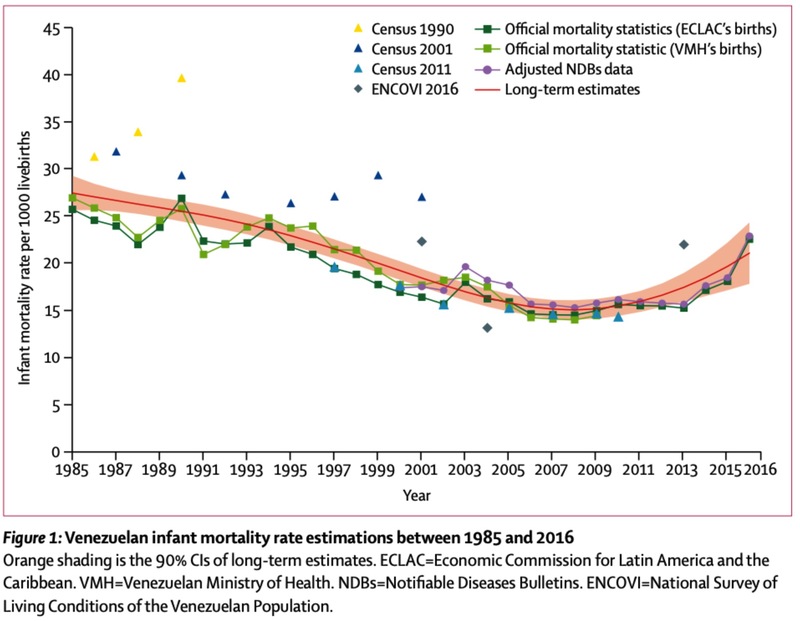 Background Between the 1950s and 2000, Venezuela showed one of the most substantial improvements in infant mortality rates in Latin America. However, the recent economic crisis alongside an increase in infectious and parasitic diseases might be reversing previous patterns. Because no official updated mortality statistics have been published since 2013, the effect of these recent events has been difficult to assess accurately. We therefore aimed to estimate infant mortality rate trends and report the effect of the crisis. Methods We estimated infant mortality rates using direct methods (ie, death counts from Venezuelan Ministry of Health via yearbooks and notifiable diseases bulletins, and birth records published by the UN Economic Commission for Latin America and the Caribbean and the Venezuelan National Institute of Statistics) and indirect methods (using census data and a Living Conditions Survey ENCOVI 2016). We shaped yearly estimations using a semiparametric regression model, specifically a P-Spline model with a cubic thin plate base. The primary objective was to estimate infant mortality rate trends from 1985 to 2016. Findings Around 2009, the long-term decline in infant mortality rate stopped, and a new pattern of increase was observed. The infant mortality rate reached 21·1 deaths per 1000 livebirths (90% CI −17·8 to 24·3) in 2016, almost 1·4 times the rate of 2008 (15·0, −14·0 to 16·1). This increase represents a huge setback on previous achievements in reducing infant mortality. Interpretation Our conservative estimation indicates that Venezuela is in the throes of a humanitarian crisis. The increase in infant mortality rate in 2016 compared with 2008 takes the country back to the level observed at the end of the 1990s, wiping out 18 years of expected progress, and leaves the Venezuelan Government far from achieving the target of nine deaths per 1000 livebirths stated in the UN Millennium Development Goals.